What shall we use to fill in the empty spaces? Right off the bat, let's clarify something. The early recordings of The Wall that have been circulating amongst Pink Floyd fans over the last year or so are not demos. Demos are not rough recordings or works-in-progress. Many times, unsigned bands will circulate demos, usually sending them to recording industry contacts in the hopes of getting signed. Only bands not serious about success send out rough or unlistenable recordings. The use of demos are not restricted to unsigned bands either. Sometimes managers of established bands will use demos to renegotiate recording contracts or convince recording industry executives that the material should be professionally recorded and released. I doubt very much that Under Construction is a demo of The Wall. It's too rough around the edges--at times shockingly so--to be strictly considered a demo recording. At points, things are haphazardly edited together. Songs cut off abruptly, fade unexpectedly or drop out entirely for a moment as if someone at the mixing desk hit the wrong button at some point. Vocal tracks peak-out, often causing anguish to the listener's ear drums. Some instrument lines (mostly the bass guitar) meander through the background as if the person playing is making up the part as they go. Equalization is nonexistent on most tracks. Overall, most of it sounds like a 4-track recording by a band who has only the vaguest notion of how the equipment works. Well, after all that, you might think I hate these recordings. However, it is for precisely those reasons listed above that I love them dearly and consider them one of the most valuable, unauthorized Floyd recordings to be unearthed. In all of the sprawling and sometimes intimidating catalog of Floyd bootlegs, Under Construction is distinct, unique. Very rarely, apart from the now-legendary stories offered regularly by the band, do we get a glimpse into the unvarnished inner workings of a Pink Floyd album in progress, its warts and wrinkles not only intact but proudly on display. 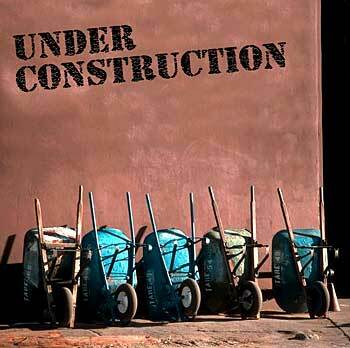 The recordings on Under Construction are exactly that, a snapshot of the album in progress, an album that is far from perfection. With it, we can prove very little, but we can deduce an awful lot. Given that our glimpses as fans under this secret shroud of Floyd studio work is so limited and often nonexistent, it's difficult to know exactly where this recording fits into the overall history of the album. Please note: no matter how certain I sound in this and the follow-up columns, no matter how confidently I express my theories, there are no experts on this topic (well, literally there are, but they certainly aren't talking.) What I offer is my familiarity with The Wall, my familiarity with the band, as well as my assumptions and my pet theories that spring forth from all that. I don't claim them to be unassailable truths, but merely informed opinions. Take 'em or leave 'em. I don't so much hope to solidify my version of these things as gospel, but rather to offer my thoughts and ignite some discussion. So where does this recording (which was unknown to fans until it surfaced last year) fit into the puzzle? What do we know? What was happening in the Floyd universe when the seeds of The Wall were planted and started to bear fruit? My guess would be that very little of what is heard on Under Construction comes from the early acoustic recordings that Roger did. I think we hear bits and pieces of it here and there, but overall, very little of that is present. So we're left with two likely periods of recording history here: the early studio recordings possibly before Ezrin reworked it all, and the later stuff that started to take the shape of the album we all know today. I would guess that Under Construction takes its material about equally from both of those periods. Contrary to standard assumptions, I don't think the recordings come from one period. It sounds like it's primarly a mish-mash of two distinct recording periods with a third mixed in. The early recordings have a sloppy, more "in progress" feel. The instruments and vocals sound loose, distant and tinny as if recorded on cheaper microphones and do so before all the music had been fully worked out. Listen to "The Happiest Days of Our Lives" or "Another Brick In The Wall, Part One" for examples. The later recordings are often (not surprisingly) similar to the final versions. In fact, I suspect a couple are early mixes of the album recordings. Vocals and instruments sound fuller and more professionally recorded. "Goodbye Blue Sky" and "Don't Leave Me Now" sound startlingly similar to the album. Apart from a few differences in the mix, you can almost forget when listening to the latter that you're not hearing the final thing. As we progress through the songs, I will rate the development of the music, lyrics and take a stab at guessing from which period the recording originates. Roger's acoustic recordings will be labelled with 1 asterisk (*); the early studio work will be labelled with 2 and the later studio work will be labelled with 3. The music is almost there, but not quite as are the lyrics. At this stage, it lacks keyboards and Gilmour's guitar fills, as well as certain drum fills. The song is played with both runs through the opening riff (as heard in the film), but there is no harmonizing guitar part during the chromatic riff that leads into the verses and closes the song. The arrangment is closer to the reprise as heard on the album ("In The Flesh"), with the clean guitar arpeggios leading into the vocals. The vocals are rough and there is a noticeably hard edit after "where you fans really stand." The song fades out during the closing riff (no "big finish" yet) leaving us with the airplane drone. The crash effect leads into baby crying as on the album, although both effects are different from the album and sound like they were lifted from some sound effects library. Because of the difference in the drum and the arrangments, it sounds like an alternate take from what we hear on the album. The most noteworthy thing about "The Thin Ice" is the dueling Rogers. At a couple of points, we hear Roger's double-tracked vocals diverge lyrically, causing a momentary paralysis in first-time listeners. It happens on the line "Dragging behind you a house and a car/And a trunk full of things for the wife." During these lines, you can also make out a second line of lyrics that sounds like ("Paying attention at school/(... swimming pool? )/Big dog and the wife.") The former two lines become noticeably louder however and virtually drown out the latter. It's funny that both of these lines lost out in the end to "Dragging behind you the silent reproach/of a million tear-stained eyes." This "dueling Rogers" effect occurs again, momentarily, during the line "You slip out of your depth" with the alternate line "Sinking out of your depth" lurking in the mix. The piano and the organ part in the background are fully developed although the synth embellishments heard on the album are not there yet. Guitar parts are developed although it's hard to tell if these are the takes we hear on the album or if they were re-recorded, especially with Roger wailing "Goodbye" loudly over it all. Drums are complete. Because of the maturity of the music, it stands to reason that we're hearing a rough mix of what we hear on the album, although the schizophrenic nature of the lyrics shows that the tune was still in a great deal of flux at this stage. Daddy what you leave behind for me? Any of you who have tried doing one of Roger's trademark Careful With That Axe, Eugene-style screams know how hard it is to do without coughing. Note the proof here that Roger is mortal after all--after the chorus, his Eugene-style scream leads to a brief coughing fit! For the most part, the music here is markedly different from the album version. Although we have the steady beat of the delayed, muted D-string, the overdubbed guitars and the arrangement are both noteably different. In fact, the clean guitar fills sound similar to the stuff heard on early live "jam" versions of "On The Run" from Dark Side of the Moon. Very little here is familiar sounding. Although there is a fair amount of development on multiple heavy guitar parts that scream over the rhythm part, none of it appears in the final version. The bass part sounds uncertain, as if the person playing (Gilmour or Waters?) is working out the part as he records it. This sounds pretty clearly to me to be a take different than what is heard on the album. Overall, this sounds like an early take. The guitar, clean but being shot through a phaser pedal, lead the way through this lethargic rendition of the music. None of the slap-your-face power of the album version is apparent here. Even Roger's vocals are hindered by a faltering, subdued delivery. The song does end with the familiar "aah-ahh-ahh" chant over the build up to "Another Brick In The Wall, Part Two" including Roger's scream. What would eventually become the biggest song on the album had a surprisingly uninspired beginning. It is essentially the same as part one, sounding more like a reprise. At first, I had assumed it was a different take, although on closer examination it appears to be a duplication of the guitar parts for part one with some changes laid atop, most obviously the lyrics. Despite the fact that we're hearing the same music, it's obvious that there has been some time lapse between this recording and the recording of part one because, although they are essentially the same, the difference in development is noticeable. The bass part has been reworked although it still meanders somewhat aimlessly (though not nearly as much as in part one.) It still hasn't reached anything close to what we hear on the final version, but it's getting there. In fact, there is a tantalizing moment mid-way through the song where the bass line nearly hits those familiar D, C and A notes. Almost. Keyboards surface meekly in this mix, although they are nothing particularly interesting, mostly high notes being held in the background as if Rick (assuming this is Rick) has fallen asleep at his instrument. Even though the keyboard and bass are beginning to carve out their places in the slow-moving chord progression, the song is far from complete. There is a hard edit at the end of the chorus and we suddenly jump back into a segment similar to the intro to "The Happiest Days of our Lives." The most intriguing developments here come from the lyrics. The "crowd control" line is surprising. The double meaning (either in school or at a concert) is appropriate and striking. This is one of the few instances where discarded lyrics on Under Construction don't sound like lyrics that should have been discarded. Rick Karhu is a staff writer for Spare Bricks.